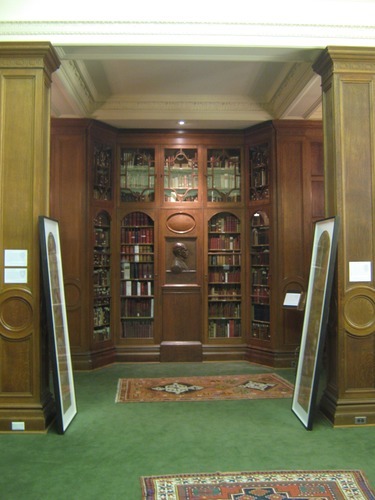 The Osler Niche is the focal point of the entire Osler Library of the History of Medicine in Montreal. 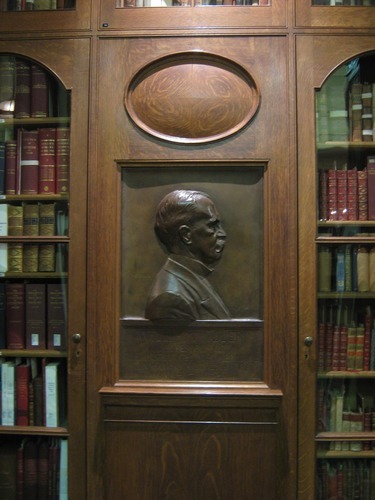 "It is a bronze bas-relief of Sir William Osler by Frederic Vernon of Paris. Lady Osler initially suggested its use in place of a bust on a pedestal (that was envisioned in the original plans). The panel just below the Vernon plaque encloses the urn containing the ashes of Sir William and Lady Osler, as specified in Osler’s will. He wanted his ashes to be placed among his most cherished items – his books. The two cabinets to the right of the Vernon plaque house a number of books by some of William Osler’s most favorite authors. The cabinet immediately to the right of the Vernon plaque is almost entirely devoted to Sir Thomas Browne (1605-1682), a physician whose literary writings were highly revered by Osler"1. 1. Retrieved from a library's label.